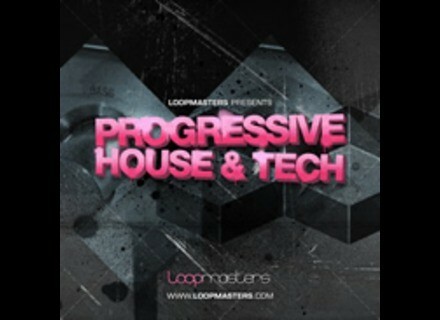 Progressive House & Tech , Techno / House / Trance Sample from Loopmasters. Progressive House & Tech is a collection of 24 bit samples for producers looking for a selection of Progressive & Tech House Samples, created with the sounds coming out of clubs in the world. Progressive House & Tech is influenced by the more progressive club sounds of artists such as The Swedish House Mafia, Funkagenda, Deadmau5 and Dubfire, and labels including Toolroom, Stealth and Nervous, according to the company. Featuring over 900Mb of sounds and samples in 24 bit quality, and available in a range of formats and file types. 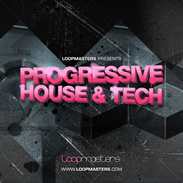 In detail, Progressive House and Tech includes more than 600 sounds, with 371 loops and 231 single sounds. Tempos are set at 126 Bpm and there are 39 Bass Loops, 123 Drum Loops, 66 Synth Parts, 11 Construction kits which feature 143 Separated Loops (Synth, Bass Drums), and 27 FX Samples. You also get 45 ready to play House Bass patches for Reason NNXT, Halion, Kontakt, EXS, and SFZ samplers. Reason Refill, Apple Loops and Ableton Live versions are also available. Ils - The Sound Of Breaks by Loopmasters Loopmasters present “The Sound of Breaks” royalty free sample pack, created in conjunction with Ils. World Drums Sessions - Balkan Drums by EarthMoments EarthMoments presents the the second in its World Music Drums Series - the World Music Drums - Balkan Sample Pack. Prime Loops Announce Digitalo Disco Digitalo Disco has arrived drawing influences from the current sounds of European electro-pop, Cosmic and Italo-Disco.